Fridays in the office are 'dress down' days. Although I get some funny looks from my lovely colleagues (!) it is so nice to be able to wear whatever I like. Still loving the military trend and camo jackets. You can buy them for a really good price on Amazon and Asos Marketplace so dont spend more than £30 on your purchase. For extra warmth I have layered my fur gilet over the top and on my bottom half I am wearing my beloved American Apparel Disco Pants. If you are thinking of purchasing a pair yourself it may be worth going a size smaller as they tend to expand as you wear them and sag slightly. Goth chic is still dominating with black leather, spiked necklaces and creeper shoes everywhere. Mine are so comfortable and add a little bit of height without the pain of heels! Thank you Joel. 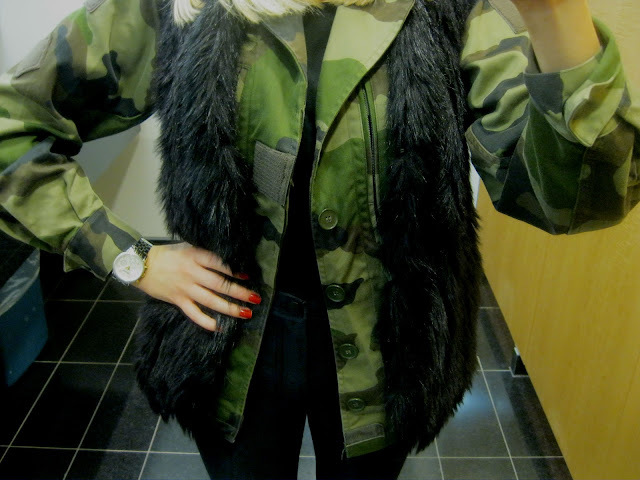 I love the army trend and adding a bit of fur to the mix!